This document refers to an older (possibly depreciated) version. Catznip R12.1 is the Latest Release (19th February 2019), Release Notes. This release has certainly been a long time coming and is our biggest single release to date, it will also be the last mega update as we move to a new shorter faster release cycle. The main new feature in R9.0 is the Chat which has been rebuilt from scratch. LL added CHUI, we spent a huge amount of time trying to make it nice only to find the performance with it enabled was unacceptable. As the old chat was removed at the same time we had no choice but to start over. Chat has been reimplemented from scratch and includes many CHUI inspired features. Inventory searching has been made lightning fast, textures now have a preview tool-tip, script editor got a lot of love with a tighter UI, as you type highlighting for text searches, more work was done overhauling the UI and a new in place updater was added. From Linden Lab this release adds CHUI (even though we don't expose it), facebook support, fitted mesh, materials, ribbon particles and request teleports amongst others things. In answer to huge gap between R8 and this release we shelved a lot of things we were working on and started our open beta program. A huge thank you to everyone who got involved, reported bugs and issues, helped find bugs and crashes, made suggestions. This has been so successful that it will form the basis of all releases going forward. Future releases will be smaller and incremental with more public testing. 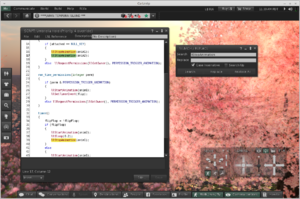 We hope this will allow up to keep up with Linden Lab, continue to deliver unique new features and make Catznip the most stable Second Life viewer. There is a small mountain of work we did that just isn't polished enough to get in this time, expect to see a new things coming through thick and fast as we go forward. These release notes aren't finished yet, I have pictures to add and all sorts of stuff to document but figured it better released sooner rather than making everyone wait for me! Catznip JIRA : Report bugs & Request Features in Catznip or RLVa. Pages in category "Catznip R9"
Second Life™ and Linden Lab™ are trademarks or registered trademarks of Linden Research, Inc. No infringement is intended. This page was last modified on 11 May 2014, at 17:57. This page has been accessed 64,742 times. Content is available under Attribution-NonCommercial-ShareAlike 3.0 Unported.